William: You’ve spent your whole life wanting to be your own woman. Why do you want to change things now? 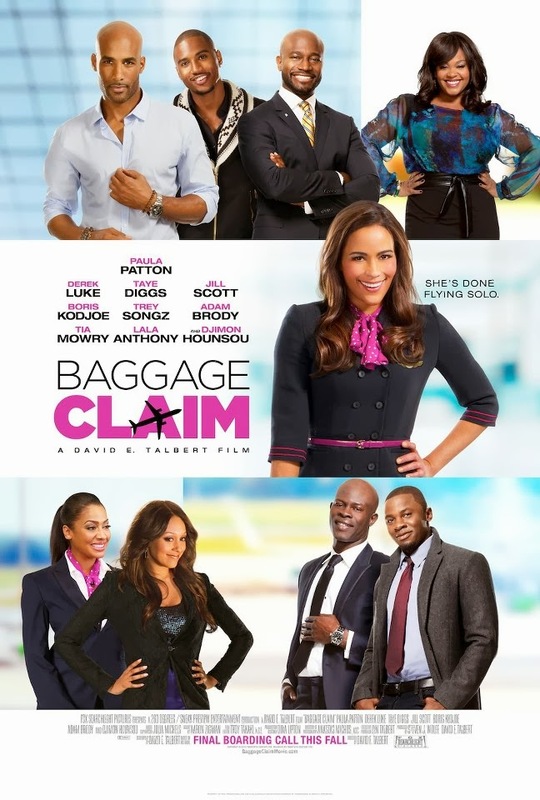 Baggage Claim has come from a long line of romantic comedies featuring impossibly beautiful women with problems finding love. It is annoying to have to say something like, “take my words with a grain of salt, as this is not my preferred genre,” but it is true. 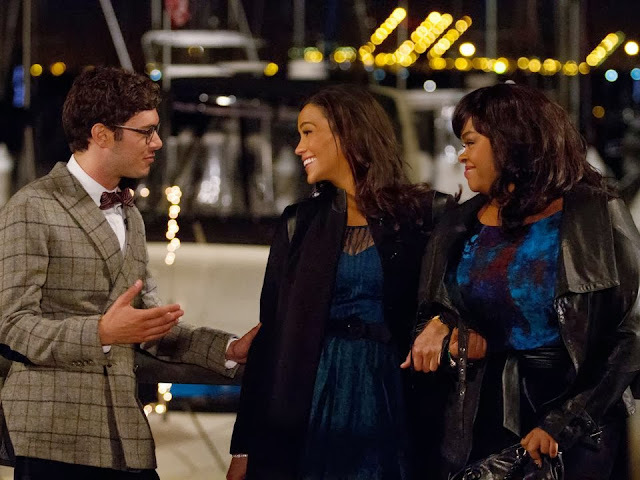 Baggage Claim is definitely a film that is made for an audience that is into these kinds of clichéd romantic comedies, which feature attractive casts and the bare minimum requirements to develop a premise that slightly differs from those that came before it. One can throw the “hypocrite” label at me all they want, when I recommend a horror movie that feels ever so similar to another one and does not do a whole lot new, but what can I say? Some movies just do not work for me, especially when I have examples of similar ones that do. Baggage Claim may work as easy entertainment for some, but there is very little here that had me legitimately enjoying the film. The story is a race against time plot, set over the course of a month. 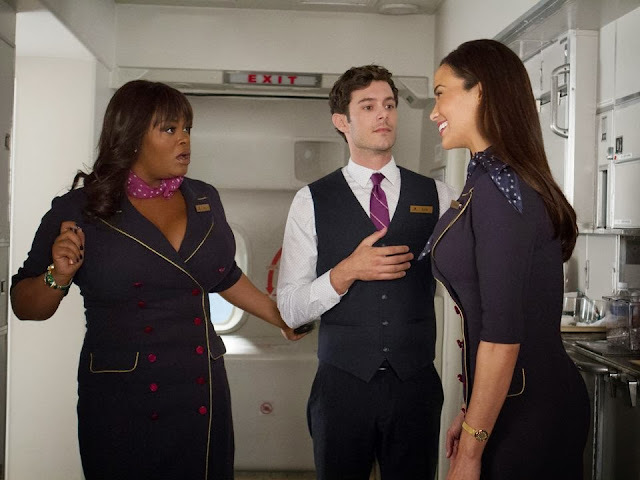 Paula Patton stars as flight attendant Montana Moore, a woman determined to get engaged before her youngest sister's wedding, after her latest relationship turned out to be too good to be true. Using her airline connections to "accidentally" meet up with some of her ex-boyfriends, she travels all over the country, while searching for the perfect guy. It is a light and fluffy story, featuring revelations about long-time best friends of the opposite gender, sassy best friends encouraging carrying on with the wacky plot, and a climax that manages to include wedding-related events and a mad dash through an airport terminal. The film is spearheaded by Patton and features a large, almost all black cast. Derek Luke, Jill Scott, and Adam Brody star as Montana’s friends. 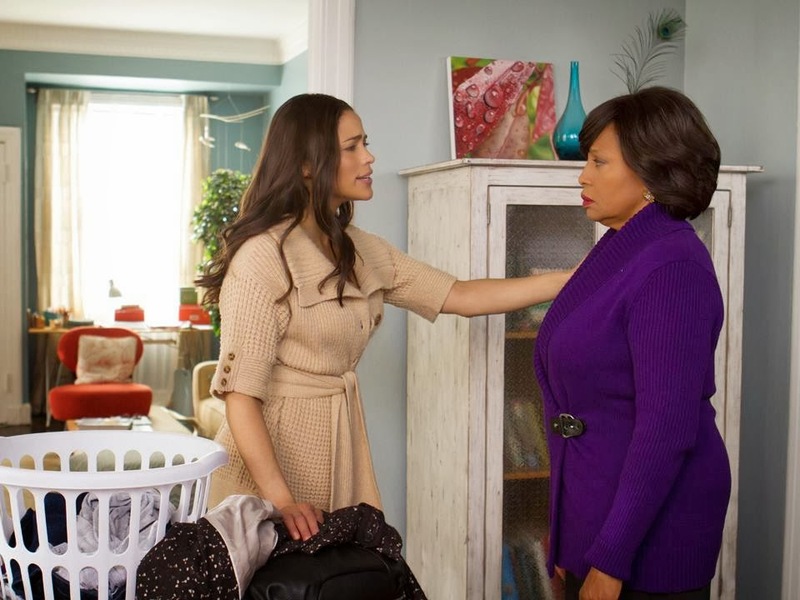 Jenifer Lewis plays her mother, who has been married five different times. Boris Kodjoe, Taye Diggs, Trey Songz, and Djimon Hounsou star as Montana’s possible suitors. And Ned Beatty pops up as the rich white man, who is vaguely bigoted, when addressing Diggs’ politician character, because why not? Ned Beatty can do what he wants. Is there much of a reason to get into what I thought about the story? The film hits so many familiar beats, it became very easy to call out the various lines of dialogue a character would inevitably say. “Oh you work at the hotel,” says Montana to a potential suitor, “I Own the hotel,” is of course the response. Moments like these are not necessarily a hindrance to a film that could be better, just a reassurance that you have entered the right movie, assuming you jumped on board to a film with little to offer in the way of innovation. Writer/director David E. Talbert, who wrote the book this film is based on, certainly has the benefit of a cast that is comfortable going through the motions of a film like this, but has also left me wondering what specific romantic comedy films he was inspired by, rather than real life situations, as this film is clearly a derivative fantasy. Yes, Baggage Claim can only exist in a fantasy world. While I may not know how much a flight attendant makes in order to lease or own an incredibly large and fancy apartment in Baltimore, I am pretty sure no one wakes up in the morning looking as good as Paula Patton does. Sure, this is a movie of a certain type, but it just adds to my point, once again, what is being proved here? The film gets points for being likable enough, as no character (that you are supposed to enjoy in some manner) is portrayed in a way that does not make you completely dislike them, but that is not really enough. I will say I like Paula Patton quite a bit. She may not be the most gifted comedic actress, but she has a certain quality that makes her a very likable screen presence. That said, stepping into more dramatic territory, or even more action territory (I like her “in the midst of danger face” that pops up here, as well as in Mission: Impossible Ghost Protocol), seems like a place I would be happier to find her in. The rest of the cast is fine, but add nothing that really stands out. I can only imagine that Adam Brody and Justin Long take turns playing “gay best friend” in movies, but Brody and Jill Scott are fun enough as Montana’s fellow flight attendants/angel & demon relationship supporters. Taye Diggs relishes playing the controlling ex-boyfriend, while Djimon Hounsou is in the exact opposite position, playing the kindest man of them all. If I have explained all of this and one is still not convinced they do not see a reason they would not enjoy this movie for what it is, I can also add that the movie looks cheap, feels long, and seems confused by what it is trying to accomplish. It is rare that I notice how cheap-looking certain sets feel, but that seemed apparent here (enough so to distract me, at least). I was surprised to see that this film was only 97 minutes, as it seemed to really carry on for a while. And by the time it reached its finale, Montana seemed to be making up her realizations as she went along and announcing what she learned to various friends and family, while baffling what I thought was going on. I have maintained that it is not my place to say, “go see” or “do not see” this movie, but there is no denying that I have gone to see movies like this that were more enjoyable, simply because they handled these details more effectively, which can make all the difference in what is supposed to be light fun. Baggage Claim is by no means a burden of a film to have seen, as it balances its trite story and other disposable elements with a likable cast and breezy tone. I only wish it was something that could work as anything more than a possible guilty pleasure for someone that enjoys these kinds of movies. The film means well, attempts to differentiate itself in some fairly limited ways, but never rises above “sorta average”. 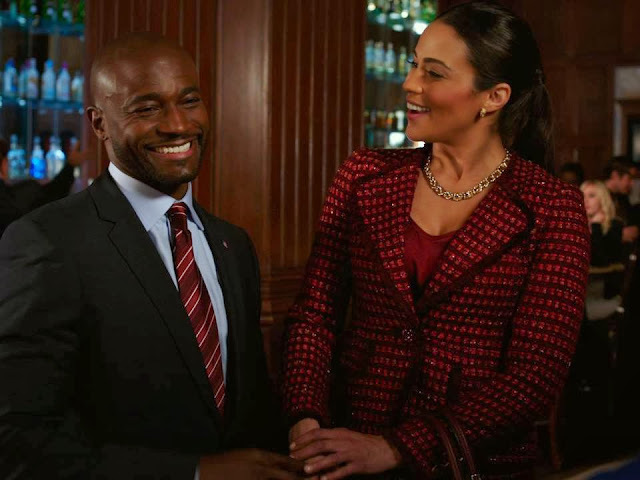 Paula Patton is nice enough to watch as the lead, but I would have been happier claiming my baggage elsewhere. Montana: I’m in the trash can.